A casual stroll through the cosmetics department of the nearest convenience store reveals an overwhelming plethora of skin care products marketed to reverse or halt the effects of aging. Yet despite the claims of the products’ effectiveness, a reliable, comprehensive, standardized and cost-effective method of testing these claims has not yet been introduced. Harnessing the opportunities presented by 3-D bioprinting technology, Associate Professor Kan Cao from the University of Maryland Department of Cell Biology and Molecular Genetics has invented a new platform to test the anti-aging properties of cosmetics and provide consumers with reliable data on these products. 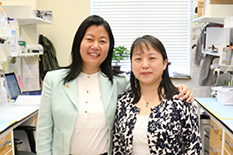 Assistant Research Professor Zheng-Mei Xiong, also of the Department of Cell Biology and Molecular Genetics, contributed to its development. The platform is capable of measuring information about aging skin cells such as biomarkers, cell proliferation, damage caused by free radicals, and more. The team’s invention is unique in that it tests cosmetic ingredients’ anti-aging properties on 3-D bioprinted skin, as opposed to using animals. Using a step-by-step process to test the anti-aging skin care products, the research team has developed a unique approach based on years of experience in the field. Cao and Xiong’s cosmetic testing platform accurately measures many different aspects of cellular aging, including free radical accumulation, pigmentation, cell integrity, wound healing ability, integrity of the cell’s nucleus and cell function, and skin cell proliferation and death. Looking to the future, the team hopes that the platform will become a standard in the booming cosmetic industry, which accounts for $56.3 billion in revenue in the U.S., according to Statista. The team’s research was supported by the Maryland Innovation Initiative and the UMD Startup Fund.